Gardeners living in warm regions are fortunate to be able to add gardenia shrubs to their landscaping areas. Not only are gardenias attractive shrubs that can grow to as large as 15 feet, but they are also delightful with their sweet-smelling white blossoms in early spring. Gardenias grow abundantly in most soils and flourish in sunny locations. Choose a place to plant a gardenia shrub that will be close enough to enjoy the scent of the blossoms each spring. Select the growing area for gardenias carefully. Choose an area that receives full sunlight for best results, although partial shade may be acceptable. Do not plant gardenias near cement foundations because soil near cement tends to be alkaline and gardenias prefer acidic soils. Keep gardenias away from high-traffic areas as well, because these disturbances could lead to less plant growth. Work the soil prior to planting gardenias. Use the spade to break up the soil down to a depth of approximately 6 inches and add 2 to 3 inches of compost to the top of the soil. Work the compost into the soil with the spade. Gardenias prefer a soil pH balance of 5.0 to 6.5. Consider testing the pH balance of your soil prior to planting gardenias. If your soil pH level is over 7.0, you may have difficulty growing gardenias successfully. Planting gardenias in containers may be a better option in this situation. If your soil pH is less than 5.0, amend with limestone to raise the pH level of the soil slightly. Dig a hole for each gardenia shrub. Make each hole twice as wide as the diameter of the current planting container and as deep as the root system of the gardenia shrub. Space each hole approximately 6 feet apart. Carefully take each gardenia from its container and place in a prepared hole. The top of roots should be just above the soil level. Replace soil back into the hole to fill it halfway. Fill the planting hole with water and wait while the water absorbs. Fill the hole to the top with soil and tamp down the soil firmly. Use any leftover soil to create a 2-inch high ridge encircling the entire plant to help the gardenia retain water. Lay 3 inches of mulch around the base of the plant. Be careful that the mulch does not actually touch the plant, however, because this could create fungal issues. Mulch will help conserve moisture in the soil. Water the gardenias at least twice per week during the initial six weeks of growing. After the gardenias become established, keep the shrubs watered adequately if rain does not fall. This is especially important while the gardenias are budding. Fertilize gardenias in the early spring, in the middle of the growing season and again at the end of the growing season. Use a granular fertilizer and consult the package label for measurement recommendations for your plant size and growing area. Prune gardenias immediately after they bloom by trimming overgrown branches lightly and removing the spent blossoms. 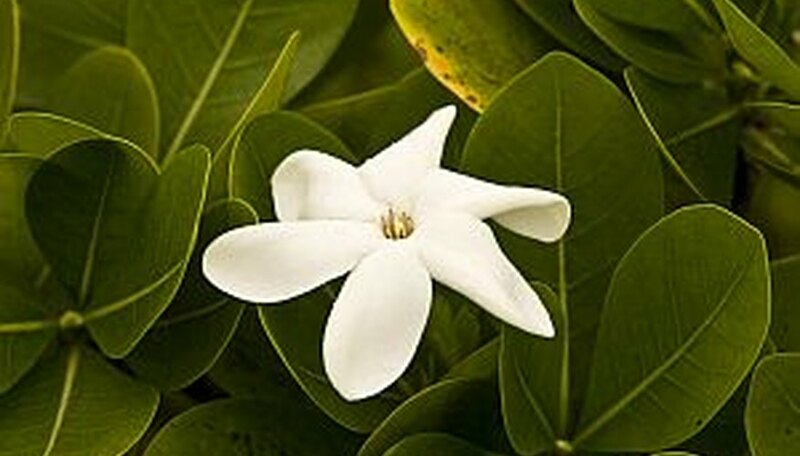 General shaping is usually all that is necessary for gardenia shrubs. Gardenias are hardy to USDA zone 8b. If gardenia foliage becomes yellow, an iron deficiency may be the cause. Chelated iron is readily available at gardening centers and will often improve the nutrients in the soil around the gardenia shrubs. Follow package recommendations for measuring amounts.